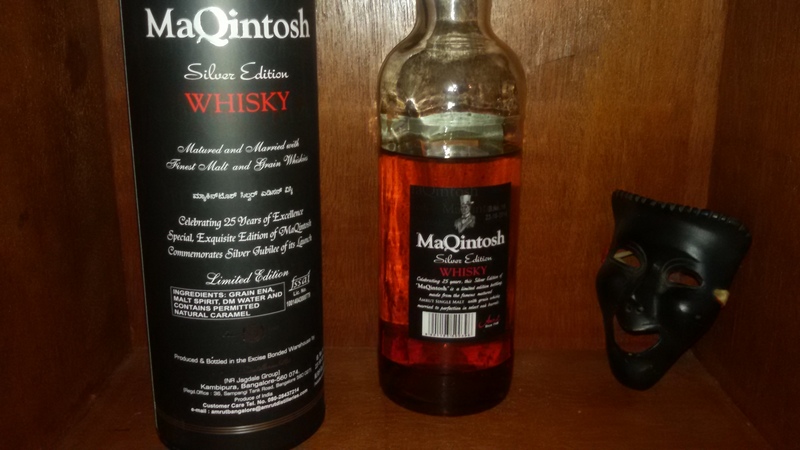 This entry was posted in Beyond Scotland, India and tagged Amrut, India, Indian whisky, Maqintosh, Maqintosh tasting notes, Mass market, Mumbai, Whisky blend by Carissa Hickling. Bookmark the permalink. In Mumbai you find it in most wine shops however I’m not familiar with distribution in Kolkata. Perhaps try contacting the company Amrut? Very well explained Carissa. I too was hesitant the first time but since I am an Amrut lover I decided to give it a chance. Have had it multiple times since then and actually started liking it (This is coming from a regular BP drinker). Its available for INR 670 here in Gurgaon. I still have to try the Silver Edition. Good work you’re doing. Do you also have a FB page where we can follow your findings? I quite enjoy it – and it certainly beats the Blenders, Antiquities, etc. I wld go so far as to say that I even prefer it to the J&B’s, Cutty’s, etc. I love it’s smokey (almost bacon) palate.